Pinterest can be a great addition to your existing marketing plan, especially when you want to promote a new product or service. While advertising often has just one stand-alone image and some text, a Pinterest board gives you a chance to showcase many facets of your product. This guide takes you through the thought process and implementation of creating a Pinterest board to promote a specific product or service. The best boards have some planning behind them. Think about the purpose of the board and how the images you pin will support that purpose. If you want to present a new product or service, you’ll want to include images that put it in the best light. Think about the result you want the board to obtain, such as introducing people to your brand or enticing potential customers to buy. Ideally, customers will see your board and decide they can’t live without your offering. Consider creating an infographic of the product with callouts that identify the features or parts and explain both the functionality and the importance of the feature. If the product development or manufacturing process is particular, pin a video with an interview of the product developer or show the factory where the product is made. If the product is made with special materials, photos of the raw material add visual interest to the board. For service-based businesses, testimonials make great pins. You can create text-based graphics or include quotes with photos of your service in action. I cannot be emphasized enough: the intent should be to help customers identify with the product and feel good about buying it. And, remember to put a watermark with your company name, or better yet your website address, on all in-house images. You can also pin an invitation to visit your website, leave comments, or answer questions to a survey. Participation garners useful focus group type information for you and helps your customer feel aligned with your brand. One of the best ways to build your Pinterest presence is to re-pin and be re-pinned. Re-pinning creates a ripple effect across the Pinterest universe. Each time one of your pins is re-pinned, the number of people who see that image expands because the followers of the person who re-pinned will see your pin. A good way to encourage re-pinning is to re-pin other images on your board. Everyone on Pinterest appreciates being re-pinned, and most users will often check out the profile of the person (or company) that re-pinned them. This increases the chance of picking up new followers. Using keywords related to your product or service, search for pins that could be a good addition to your board. Think about lifestyle images that either show people using your product or that reflect the type of customer who buys your product. For example, if you sell lawn furniture, images of gardens would be a good addition to your board, and all the better if they contain your furniture. 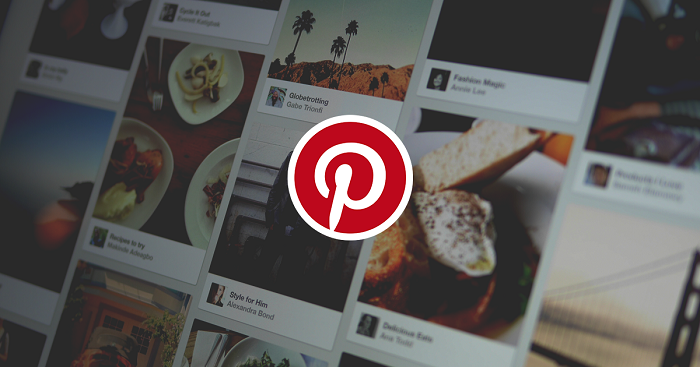 Social Media: You want to drive potential and existing customers to your Pinterest page. The obvious way to do this is through other social media, such as Facebook or Twitter, but you also want to make sure you have the Pin It and Follow Me buttons on your website and, if you use print advertising, make the Pinterest logo part of your ads so people know you’re there. Usually, once someone starts browsing Pinterest, they stay for a while and come back again and again. With that in mind, you want to keep adding new pins and new boards as your product and service lines evolve or change. Your Blog: If your company has a blog, this is the perfect space to mention a new Pinterest activity, such as the creation of a new board. Your company’s blog is a great social platform to create excitement around your Pinterest account because you can include screenshots and photos of content you’ve pinned to get your customers excited and pique their interests about what you’re up to on Pinterest. A blog post can contain a lot more information than a Facebook post or Tweet, so make sure you’re utilizing this space and opportunity to talk up your Pinterest activity. 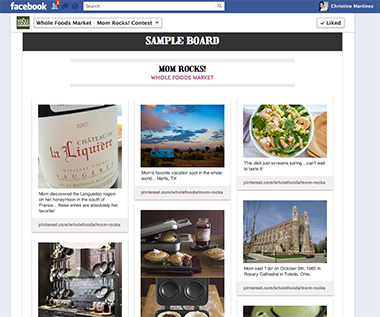 For example, Whole Foods started a new Pinterest board entitled “Mom Rocks” to promote and provide examples for a Mother’s Day Pinterest contest they were running. 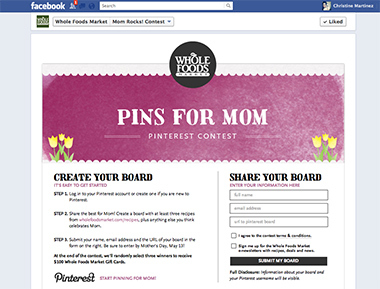 In order to let their customers know they had created this contest driven board, they utilized their presence on Facebook to draw attention to their activities on Pinterest. And, beyond just announcing their new board and contest, they also provided visual examples of their “Mom Rocks” board. While a contest isn’t necessarily a new product, the idea here is still the same. Whole Foods developed a new Pinterest board with a clear title and interesting photographs to visually support what they wanted to communicate to their customers. To promote this new board, they used their existing social media platforms to grab and redirect their audience. And in the process, they most likely picked up new Pinterest followers, and most likely, some Facebook fans as well. The result is a strong marketing campaign revolving around a new Pinterest board. Remember, although your Pinterest boards should be able to stand alone, there must be a cohesive message between them. This message strengthens your brand and promotes brand recognition. As you work on other aspects of your marketing plan, keep in mind how they can be integrated with your Pinterest presence. Happy pinning!